Every home needs a great outdoor living space. Your outdoor area is the perfect place to spend time with friends and family, or to simply sit back and enjoy being out in the fresh air. Whether you have a big backyard or only a tiny patio area to work with, there are plenty of things you can do to create the perfect outdoor living space. Here are some great tips and tricks for transforming your outdoor area into the ideal place for entertaining and relaxing. You’re already outside, so why not make the most of it and liven up your outdoor area with plenty of plants and greenery? Don’t restrict yourself just to garden beds and potted plants – think outside the box and incorporate greenery in different ways. Thread a trellis with blooming vines; brighten up a wall with small pot plants held in brackets. You could even consider an entire vertical garden, which is a striking wall-mounted option for herbs and other small plants! Use plants to add some natural colour to your outdoor living space. And remember that bright pops of colour can be achieved not only with plants, but with their containers. Have some fun choosing pots in a variety of different (yet complementary) colours and styles. Bonus tip: for easy outdoor table décor, head to your own garden and pick a mixed bouquet of flowers or a posy of fresh herbs. Then simply set out a nice vase and voila – you have an instant centrepiece for al fresco dining! Speaking of colour… The colour palette of your outdoor living area is really important if you want to create a cohesive, well-designed feel. Everything contributes to the palette, from the shade of your timber decking to the colour of the cushions on your outdoor furniture, so take a moment to be sure everything will blend and flow well together. Don’t just throw bits and pieces together at random! Let the colour palette you choose reflect the atmosphere you want to set in your outdoor area. 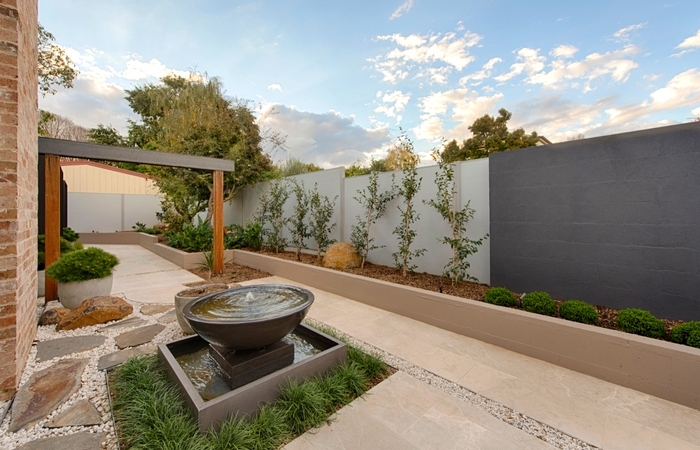 If you want to create a peaceful outdoor oasis, choose soft, muted colours that will promote calm and relaxation. On the other hand, if you want to create the ultimate outdoor entertaining and party space, perhaps consider a bolder palette, full of bright pops of colour. If you’re looking for inspiration, check out Pantone’s nine new colour palettes for ideas on what sort of colours will be popular in home design in 2017. There’s nothing worse than being uncomfortably hot at an outdoor gathering in the height of summer. 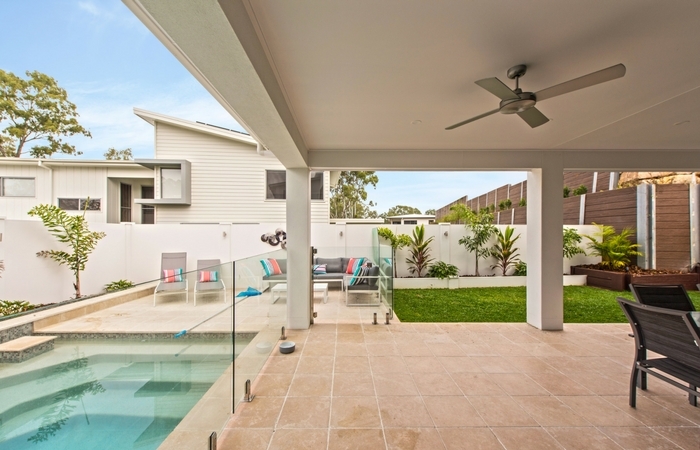 You want to be sure your outdoor living space can be utilised even when temperatures start to soar, so consider what sources of shade you might introduce. A covered patio area will serve you well in all seasons. Traditional roofing is a more pricey option, whereas sailcloths, canopies, awnings, outdoor blinds and large umbrellas are cheaper choices that also offer some protection from sun and heat. Try to incorporate your garden into shade solutions if you can, too. There’s nothing like the shade of a large, leafy tree (and the hint of a breeze) to keep your living space cool in summer! 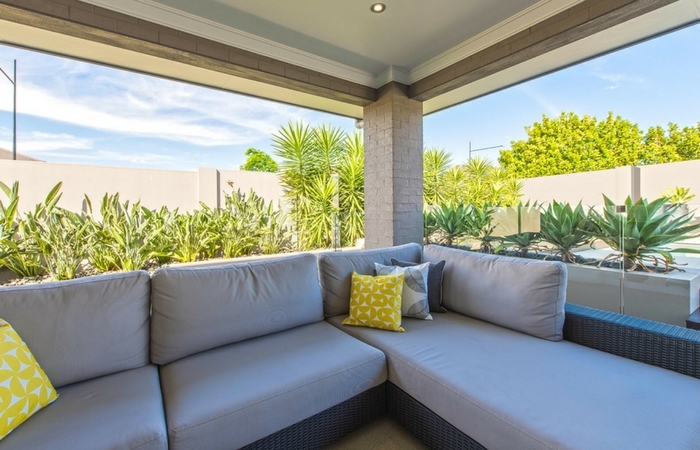 Shade solutions can also provide a measure of privacy for your outdoor living area, so it’s worth investing some time, effort and money into finding the perfect shade option. Just as we want to beat the heat outdoors in summer, we want to warm things up in winter. Cooler weather doesn’t mean you have to spend all your time holed up indoors. You want to be able to use your outdoor living space all year round, so be sure to think about heating solutions for the colder months. Popular outdoor heating options include ‘mushroom’ or ‘pyramid’-style patio heaters, outdoor fireplaces, fire pits and fire bowls. Fire tables are even an option now: a mini fireplace as the literal centrepiece of your outdoor table! Any heating options involving open fires will also become attractive focal points for your outdoor area, as they can be quite striking in appearance. Plus, who doesn’t love warming their hands over a fire in winter (and toasting a marshmallow or two)? Just be sure to check your local area’s rules and regulations when it comes to open fires in backyards. First things first: there must be plenty of places to sit in your outdoor living space! You want to make it an inviting place to sit and relax, both for yourself and for any guests you entertain. Obviously, you don’t want to overcrowd the area, but providing a number of different types of seating options is your best bet. There are so many different choices when it comes to seating. Chairs, benches, stools, outdoor sofas and couches, even daybeds… The list goes on. Mixing and matching furniture pieces is absolutely fine – in fact, it’s quite on trend at the moment. Serve an outdoor dinner at long wooden tables and benches, then retire to cushioned wicker chairs and an outdoor sofa for drinks and conversation. Oh, and don’t forget to scatter around plenty of cosy cushions to make sure everyone is comfortable! Al fresco dining is likely to be one of the primary functions of your outdoor living space. When you’re creating your ideal outdoor area, be sure to consider how you’d like to use it in terms of dining and cooking, and include the right equipment to facilitate this. Obviously, one of the first things many people will consider is a gas or charcoal barbeque or grill. This can be a standalone BBQ or one that’s built in using materials like brick or sandstone. Other popular outdoor cooking options include wood-fired pizza ovens and fire pits. There’s even been a recent trend of creating a fully equipped kitchen for your outdoor area. This is a large area dedicated completely to outdoor cooking, including things like fridges, sinks, storage and bench space as well as the cooking facilities themselves. After you’ve decided on cooking facilities, don’t forget about the most important part: eating! It’s ideal to have at least one long table at which to serve outdoor meals and accommodate guests. Some form of shelter over the eating area is a good idea, too – try a built-in umbrella or an extendable/retractable shadecloth. 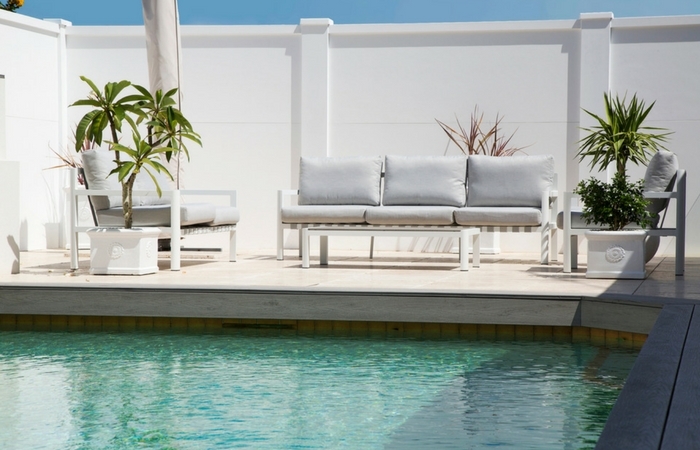 Choosing outdoor furniture made from any of these materials is a pretty safe bet and should ensure that your furniture stays in good condition. If you’re fairly handy, there is also the option to weather-proof outdoor furniture yourself. This is usually quite a simple DIY project, but you want to be sure you’re doing it right to avoid damaging the furniture. As well as choosing durable furniture, it’s also a good idea to select multi-functional options – pieces of furniture that serve multiple purposes. This could include things like bench seats with room underneath that also function as a storage space. The more you can achieve with your outdoor furniture, the better! Lighting is essential for enjoying your outdoor living space in the evenings. You want to make sure things are well-lit, but not too well-lit. Too many lights, or lights that are too bright, will create a harsh, uninviting effect. But if you get the lighting right, you can create a beautiful atmosphere and make your outdoor area look stunning. Whichever lighting sources you choose, be sure to position them carefully, especially stronger lights. You don’t want beams of light glaring into your (or your neighbours’) windows, and you don’t want to create light pollution that dims the beauty of a starlit night spent outdoors. Safety is also something you should consider. Make sure paths, walkways and steps are all lit well enough for people to see where they’re going. Once you’ve chosen a focal point, build the rest of your outdoor area’s design features around it. It will usually serve as the central gathering spot, around which furniture and other items like plants will be carefully arranged. If you’re struggling for ideas when it comes to decorating your outdoor living space, perhaps consider introducing a theme. Themed décor, provided it’s not overdone, can work really well in establishing mood and atmosphere in an outdoor area. Beach/coastal. This classic theme can be easily achieved with a few key pieces: light-coloured wicker loungers, water features, a neutral palette with pops of blue, aqua and seafoam-green, and so on. Asian-inspired. Think lanterns, tranquil gardens, comfortable cushion seating, and a pond filled with koi and water lilies. A porch swing covered in boldly patterned cushions, paired with mismatched vintage furniture pieces, creates an on-trend boho look. Mountain/cabin theme. Perfect in winter, this theme could involve a crackling outdoor fireplace, rich, dark wood furniture, and even a durable outdoor rug. Rustic country garden. Comfortable, rustic furniture pieces and plenty of flowering plants will help you create a country-style living area no matter where you are. When creating your ideal outdoor living space, remember to keep its primary purpose in mind. Whether you’ll be using it mainly for relaxing or for hosting plenty of lively gatherings, your outdoor area should be perfectly matched to the way you love to spend your time outside. Keeping all these tips and tricks in mind, you’ll be well on your way to creating an outdoor living space that you, your family and friends will love.